for Forum 2014- March 10 , 2014 at Unicredit Centre, from 4:30 PM to 7 PM with Cocktail reception until 9 PM. Please save the date and/or register for free to secure your seat at the event. Drucker Society Europe participation at the European Business Summit (EBS) on May 14, 2014.
at the European Forum Alpbach on August 27, with Charles Handy as the keynote speaker. For the Peter Drucker Society Europe a very important year is coming to an end. The fifth Global Peter Drucker Forum has attracted top speakers and participants from around the globe (350 participants from 48 countries plus some 1000 registrations to the live stream). Due to important partnerships with key business and management media such as Harvard Business Review and the Financial Times and increasing presence on social media the Forum reached a new level of global visibility and recognition. In 2013 we had significant innovations: in addition to the Global Peter Drucker Challenge Essay Contest we have implemented a Video Contest as a world premiere for Management. The Oubey Exhibition brought the world of Arts directly into the Druker Forum. We appreciate the support and trust of those who have actively participated in the Forum and/or other Drucker Society Europe events. While we feel encouraged by the positive reactions that we receive - we see ourselves to be engaged in a continuous learning process and appreciate your feed-back. Please save the date for the Drucker Forum 2014 and the Launch Event. 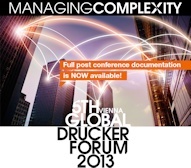 the Global Peter Drucker Forum 2014 on November 13 and 14 in Vienna. The Forum 2014 will be chaired by Adi Ignatius, Editor in Chief of Harvard Business Review and will feature word class speakers including Clayton Christensen, Gary Hamel, Pankaj Ghemawat, Rita McGrath and Vineet Nayar. Together with the Drucker Society Europe Team I wish you a Merry Christmas, Happy Holidays and a good and successful New Year. Guests include: JohnHagel III, Don Tapscott, Tim Brown and Andrew Schwartz (a winner of the Drucker Challenge Essay Contest). Article by Raymond Hoffmann - Can the Elephant learn to dance?